When in Expert Mode (the checkbox in the upper-right corner) there are many more choices for how the database can be searched. 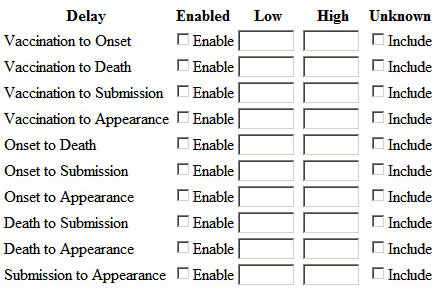 There is also a checkbox Uniform Delay Groupings which causes the table or graph of delays to use a uniform spacing (in days). When not checked, the delays are grouped into these intervals: 0 days, 1 day, 2 days, 3 days, 4 days, 5 days, 6 days, 7 days, 8 days, 9 days, 10-14 days, 15-30 days, 31-60 days, 61-90 days, 91-120 days, 121-150 days, 151-180 days, 181-210 days, 211-240 days, 241-270 days, 271-300 days, 301-330 days, 331-365 days, 1-2 years, 2-3 years, 3-4 years, 4-5 years, 5-6 years, 6-7 years, and over 7 years. The Write-Up field is a multi-paragraph description of the VAERS report. 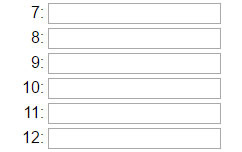 You can search for text in this field (in Section 2 of the search form), but because the field is arbitrary text, there may be surrounding words that change the meaning of the search. For example, when searching for the word "pregnant" in the Write-Up, it will match reports that state "patient was not pregnant". These show the searched text with up to three words before and after, allowing you to see the context of the search results. They are mostly intended for use in Tables where the results can be easily viewed, sorted, and analyzed. When choosing Symptom Keywords in Section 2 or Vaccines in Section 3, it is possible to choose multiple items. For example, you can search for "HPV", "HPV2", and "HPV4" in the Vaccines list. Multiple selections indicates that cases with any of the listed vaccines will be presented. However, what if you want to see cases with all of the listed vaccines? For example, what if you want to see cases in which DTAP and MMR were given at the same time? To do this, click on Match All under the Symptom or Vaccine list. Enter ages into the 18 fields in increasing order (not all of the fields need to be filled-in). Each break will be for ages less than the value in the field. For example, placing 0.5 in field 1 means that ages under 6 months will be in the first age break and ages 6 months and older will be in higher age breaks. Set Standard loads the age breaks that you get if the Custom option is not selected. Set 'Wonder' loads the age breaks that CDC Wonder uses in its age grouping. Set 'Census' loads the age breaks used by the U.S. Census bureau. Set Uniform loads a uniform set of age breaks in 5-year increments. 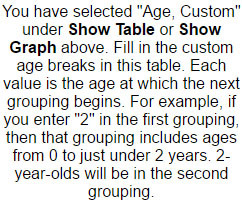 You can also set custom age breaks by specifying a lower age (From), and upper age (To) and a step (By). For example, if you set the age breaks to go From 1 To 4 By 0.5 then you will have age breaks: 1, 1.5, 2, 2.5, 3, 3.5, and 4. 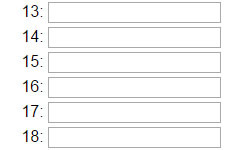 The CDC Split Type is a field that holds arbitrary text, probably from other databases. According to VAERS, it contains the "manufacturer number or immunization project number." 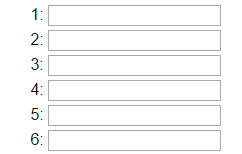 Some of the Split Type fields also contain country codes. To search this field, enter any text in the CDC Split Type box (in Section 5). This will find all cases with that text anywhere in the Split Type field. The most powerful of the Expert Mode features is the ability to create custom search and graphing code. Custom search is enabled by clicking the Enter Custom Search Code button at the bottom of Section 1. Clicking this brings up a new section of the search form that lets you "program" the search. Note that when this is done, all selection criteria in Sections 2-6 are ignored. Custom graphing is enabled by choosing Custom Graph Lines in the second grouping of the Show Graph area. Choosing this brings up a new section of the search form that lets you "program" up to 14 lines in the graph. Each line that you fill-out has custom code as well as a title that is used in the graph. Use: FIELD = VALUE to compare for equality. When comparing with true/false fields such as OUTDIED, OUTTHREAT, OUTER, OUTERED, OUTHOSP, OUTXHOSP, OUTOFFICE, OUTDIS, OUTREC, and OUTBD compare with "y". When comparing with large text fields (Symptoms, WRITEUP, PRIOR, MEDS, CURILL, ALLERGIES, or PRECON) any occurrence of the string in the field is considered to be a match. Use: FIELD != VALUE compare for non-equality. Use: FIELD > VALUE to compare for greater-than (use '>=' for greater-than-or-equals). Use: FIELD < VALUE to compare for less-than (use '<=' for less-than-or-equals). Multiple expressions can be separated with AND or OR and can be wrapped in parentheses. VALUE fields matching numeric data (Delays, NUMVAX, HOSPDAYS, VERSION, or AGE) can contain numeric expressions with '+', '-', '*' and '/'. VALUE fields matching large text fields can use "_" (underscore) to match any character. So the field "p_st" will match both "post" and "pest". The field "_" will match any non blank field. NUMVAX Number of vaccinations administered. SYMPTOMHLGT Symptoms (high-level group term). SYMPTOMSOC Symptoms (system organ class). SMQ Standard MedDRA Query name. OUTDIED Whether the patient died. OUTTHREAT Whether the event was life-threatening. OUTER Whether the patient visited an emergency room or doctor's office. OUTERED Whether the patient visited an emergency room or emergency doctor. OUTHOSP Whether the patient was hospitalized. OUTOFFICE Whether the patient visited a doctor. HOSPDAYS Days spent in the hospital. OUTXHOSP Whether the patient had an extended hospital stay. OUTDIS Whether the patient was disabled. OUTREC Whether the patient recovered. OUTBD Whether the patient gave birth to a child with a defect. ADMIN Agency that administered vaccine. FUND Agency that funded vaccine. STATE State where patient lives. VERSION Intake form version (1.0 or 2.0). AGE Age of patient in years. REPORTED Date submitted to VAERS. APPEARED Date appeared in VAERS. VAX2ONSET Days from vaccination to onset. VAX2DIED Days from vaccination to death. 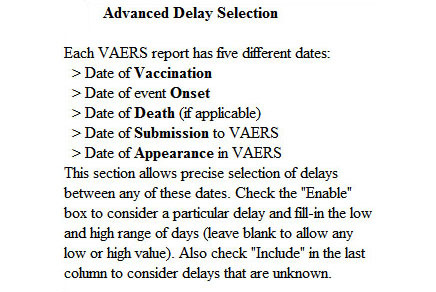 VAX2REPORT Days from vaccination to submission to VAERS. VAX2APPEAR Days from vaccination to appearance in VAERS. ONSET2DIED Days from onset to death. ONSET2REPORT Days from onset to submission to VAERS. ONSET2APPEAR Days from onset to appearance in VAERS. DIED2REPORT Days from death to submission to VAERS. DIED2APPEAR Days from death to appearance in VAERS. REPORT2APPEAR Days from submission to appearance in VAERS. MEDS Other medications being given at time of vaccination. CURILL Other illnesses at time of vaccination. PRECON Preexisting conditions at time of vaccination. ALLERGIES Allergies at time of vaccination. Not CSL: Those cases that did not (!=) list a vaccine made by CSL. GBS: Those cases that list a symptom in the Standard MedDRA Query (SMQ) named "Guillain-Barre syndrome". All: All cases (because the "Code" section is blank).